The mummy is in a good condition of preservation and wrapped in linen. 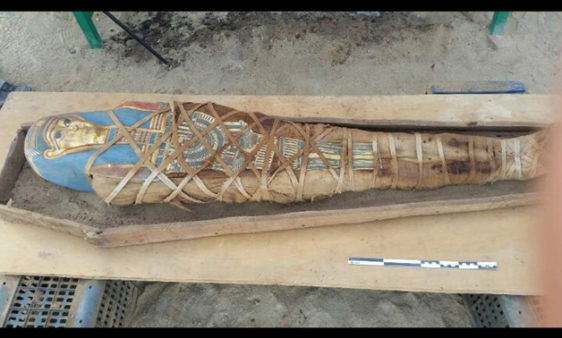 The Egyptian-Russian archaeological mission working in the Archaeological Site of Deir al-Banat (Monastery of Al-Banat) in Fayoum Governorate uncovered a wooden coffin with a mummy inside that are dated back to the Greaco-Roman era, Dr. Mostafa Waziri, Secretary-General of the Supreme Council of Antiquities announced. He explains that the mummy is in a good condition of preservation and wrapped in linen. The head is covered with a mask of cartonage in a human shape and painted in blue and gold. The Mask is decorated with a scene of God of the sky “khebr” and the chest is painted with a scene of goddess Isis. Beneath the feet there is a drawing of a white sabot. Dr. Mohamed Abdellatif, Assistant of the Minister of Antiquities and the Head of the Coptic and Islamic Antiquities Sector said that the mission carried out the first aid conservation on the coffin and the mummy before their transportation to the Fayoum storage where they would be subjected to more restoration and documentation. Dr. Abdel Latif pointed out that the coffin was found in a very bad condition of preservation. It has not any inscriptions and cracks are spreading over its base and lid. The Russian mission is working in this area since about 7 years ago and it affiliates the Russian Institute for Oriental Studies and has been headed by Dr. Galina Belova.